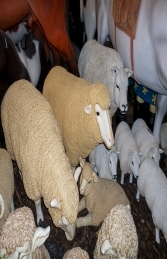 This is a fabulous curious Merino Sheep resin model, which has been made to stand with his front hooves on a fence or hay-bale. The body of this wonderful Merino Sheep would be an ideal farm-yard figure to place as if it is peering over the top of a hedge etc. This would make an ideal addition to your flock of Merino Sheep and lambs.